Downwind of obstacles, in this case, the Madeira and the Canary Islands off the west African coast, eddies create turbulent patterns called vortex streets. When two currents (in this case the Oyashio and Kuroshio currents) collide, they create eddies. 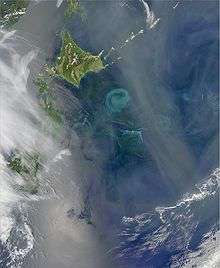 Phytoplankton become concentrated along the boundaries of these eddies, tracing out the motions of the water. In fluid dynamics, an eddy is the swirling of a fluid and the reverse current created when the fluid flows past an obstacle. The moving fluid creates a space devoid of downstream-flowing fluid on the downstream side of the object. Fluid behind the obstacle flows into the void creating a swirl of fluid on each edge of the obstacle, followed by a short reverse flow of fluid behind the obstacle flowing upstream, toward the back of the obstacle. This phenomenon is most visible behind large emergent rocks in swift-flowing rivers. Another possible type of turbulence is the vortex. This notion is now applied to gases, which have the same properties as liquids. Here, no void is created, but only an area of lower pressure, but again, a backflow causes the gas to rotate. Eddies are common in the ocean, and range in diameter from centimeters to hundreds of kilometers. The smallest scale eddies may last for a matter of seconds, while the larger features may persist for months to years. Eddies which are between about 10 and 500 km in diameter, and persist for periods of days to months are known in oceanography as mesoscale eddies. 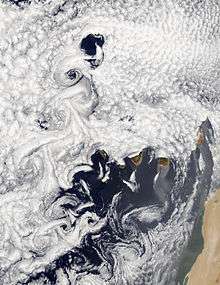 Mesoscale eddies can be split into two categories: static eddies, caused by flow around an obstacle (see image), and transient eddies, caused by baroclinic instability. 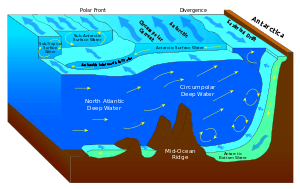 When the ocean contains a sea surface height gradient this creates a jet or current, such as the Antarctic Circumpolar Current. This current as part of a baroclinically unstable system meanders and creates eddies (in much the same way as a meandering river forms an ox-bow lake). These types of mesoscale eddies have been observed in many of major ocean currents, including the Gulf Stream, the Agulhas Current, the Kuroshio Current, and the Antarctic Circumpolar Current, amongst others. Mesoscale ocean eddies are characterized by currents which flow in a roughly circular motion around the center of the eddy. The sense of rotation of these currents may either be cyclonic or anticyclonic. Oceanic eddies are also usually made of water masses that are different from those outside of the eddy. That is, the water within an eddy usually has different temperature and salinity characteristics to the water outside of the eddy. There is a direct link between the water mass properties of an eddy and its rotation. Warm eddies rotate anti-cyclonically, while cold eddies rotate cyclonically. Because eddies may have a vigorous circulation associated with them, they are of concern to naval and commercial operations at sea. Further, because eddies transport anomalously warm or cold water as they move, they have an important influence on heat transport in certain parts of the ocean. The propensity of a fluid to swirl is used to promote good fuel/air mixing in internal combustion engines.